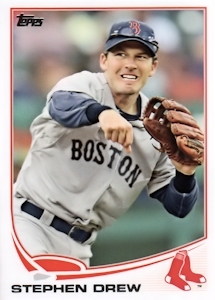 ON THIS DATE (May 6, 2013) ... With one flick of the wrist, Stephen Drew ended thgs late-night thriller at Fenway Park with a double that hit low off the Green Monster's scoreboard, fueling the Red Sox's thrilling 6-5, 11-inning win over the Twins. On most occasions, the guy who drilled four hits -- including a game-tying homer in the seventh and the game-ending double in the 11th -- would be the headliner who trumped everyone else. But this was one of those nights the Red Sox had so many people contribute to a comeback victory, and in a variety of different ways. There was Clayton Mortensen, fresh off a walk-off loss to the Rangers on Sunday afternoon, stepping in for 2 1/3 shutout innings. Not only that, but the righty was thrust in with no notice in the ninth, when Joel Hanrahan had to exit with a right forearm strain. Then there was Saltalamacchia -- his legs gassed after catching 11 innings -- finding just enough hustle to beat out a two-out infield hit to start that winning rally in the 11th. Will Middlebrooks, who has been slumping in recent weeks, belted a single to left-center, moving Saltalamacchia into scoring position. Then it was Drew's turn, and he got just enough of Jared Burton's 0-1 fastball to end the ballgame. There was also the man who almost hit the game-winner. Dustin Pedroia ended his 184 at-bat power outage at a perfect time. The star second baseman belted a solo shot off the light stanchion in the eighth to snap a tie and give the Red Sox a 5-4 lead. Pedroia's shot completed Boston's comeback from an early 4-1 deficit. Leading off the eighth, Pedroia capped a 10-pitch at-bat by mauling a 3-2 changeup by Twins righty reliever Casey Fien. Also in the eighth, David Ortiz doubled to extend his hitting streak to 26 games dating back to last season. Pedroia's wasn't the only clutch homer the Sox had against Fien in the comeback. Drew belted a game-tying solo shot against Fien with one out in the seventh.